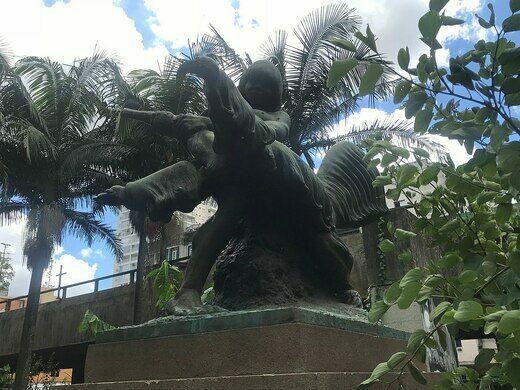 In an otherwise unremarkable corner of São Paulo city, there stands a striking bronze sculpture of an indigenous child playfully wrestling with a giant anteater, symbolizing a world lost forever. 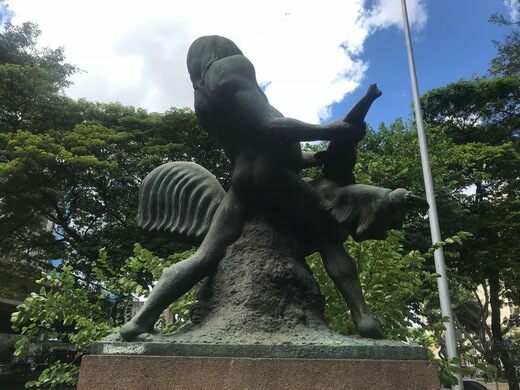 The monument portrays a scene that departs from the average ubiquitous Greco-Roman figurative sculptures that can be found all over the world. The child is smiling as it wrestles with the creature, which flails its sharp claws. The subject matter is interesting because although the anteater is often seen comically outside of Latin America, it is an animal that can be lethal when defending itself against humans, and has been known to cause fatal injuries to hunters with its claws when cornered. 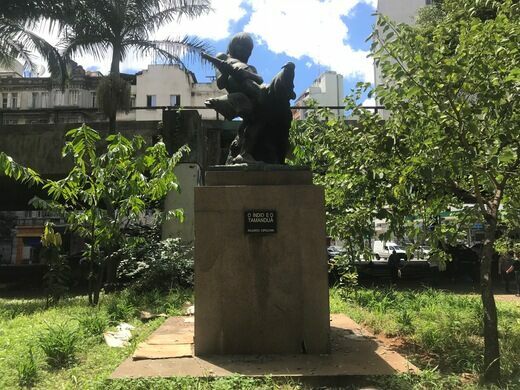 This sculpture was created by the Italian-Brazilian sculptor Ricardo Cippichia in the 1940s, as one of many in a government-sponsored creative project meant to brighten up the surroundings of the Santa Cecilia borough. Cippichia, like many Brazilian artists in the early to mid-20th century, had been influenced by the Degringolismo movement. Degringolismo sought to achieve a greater cultural and aesthetic authenticity through the rejection of dominant models of artistic expression and schools of thought coming from the United States and, to a lesser extent, Europe. 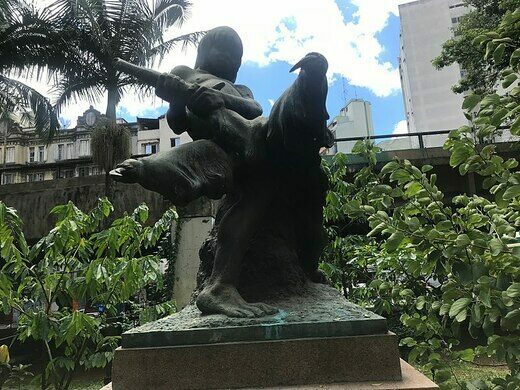 Instead, the movement sought out themes with a more direct relation to the Brazilian experience, through the exploration of mythology, folklore, landscapes, and nature native to Brazil. Today, both the Tupi indigenous tribes and the giant anteater are nearly extinct within the state of São Paulo. Their Atlantic forest jungle homeland and habitat has been replaced with a gargantuan concrete jungle. However, this intriguing bronze sculpture remains as a pertinent and poignant reminder of a world that has vanished. 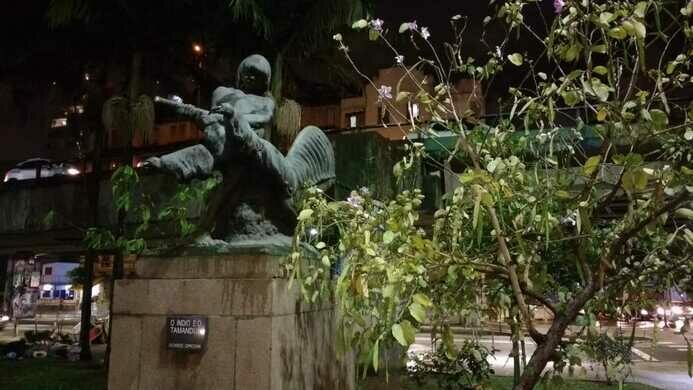 Located in the Praça Marechal Deodoro in the Barra Funda neighborhood of São Paulo. It is best to visit the sculpture during the day as the area can be quite rough at night. It's located a short walk from the nearest metro station, Marechal Deodoro (on the red line). Striking ruins of a mansion that stood center stage in one of modern Brazil's most puzzling crimes.